This is a big boat at 8.5 metres long and 2.5 metres wide a sea boat designed for the toughest conditions. 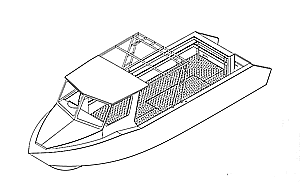 Originally designed as a dive charter boat accommodating up to 9 divers and 2 crew. The 8.5m Skip-Jack with a 250hp motor will take you where you want to go quickly and safely. If you would like a 8.5m Skip-Jack and don’t feel confident of building it, one of our licensed agents will manufacture this boat for you. For more information or a list of materials in the flat pack, Feel free to contact us.